A new film just released in the States will shine a light on one of the most notorious, but covered up, fallouts from the Contra War in Nicaragua. Every ten years the story of how the CIA covered up the Contra’s role in smuggling drugs into the US, and the subsequent introduction of crack cocaine into the poorest African American communities, gets an airing. The latest is the film Kill the Messenger, which looks at the exposé by Gary Webb in 1996, which made the link between the Contras, the CIA and crack cocaine. Much of the rest of the media and the CIA then spent the subsequent months and years trying to destory Gary Webb’s reputation, and also the man. They finally accomplished their task when Webb committed “suicide” in 2004. The Intercept, the on-line news magazine launched by Glenn Greenwald amongst others, has produced a detailed piece on Webb’s article, Dark Alliance, by Intercept journalist Ryan Deveraux. In Managing a Nightmare: How the CIA Watched Over the Destruction of Gary Webb (see here), Deveraux looks into the background of the drug running, the article from Webb in the San Jose Mercury News, the campaign to discredit Webb, and his subsequent death. The story first broke during the Contra war, thanks largely to US campaigners opposed to their country’s support for the counter-revolutionaries, and a handful of journalists. The story was buried by a combination of Cold War news management by the White House, and a pliant corporate media. This line was maintained even when a Congressional investigation in 1989 provided further proof of the allegations. Everything went quiet until 1996, when Webb expanded the story (see here for the Dark Alliance series), making a clear link between CIA support for the Contras and the drug running which the Contra network carried out. The establishment media then went into overdrive, not to dig deeper into a story which described the wreckage of communities in Nicaragua and the United States, but to try to undermine Webb. One reporter who has returned consistently to the story is Robert Parry. He broke many of the news stories regarding the Iran Contra scandal in the mid 80s, and suffered the same sort of backlash as Webb. He has written many subsequent pieces about the scandal since then. His latest (see here) summarizes his many investigations, whilst at the same time defending Webb’s reputation. Parry shows that, in the end, the story is a simple one. The CIA knew about the Contra drug running. They intervened in court cases to hide this fact. They withheld evidence to investigators. They carried out, along with the White House, campaigns to undermine the reputations of journalists and campaigners who tried to publish the truth. They briefed their friends in the corporate media to further denigrade journalists and in Webb’s case hounded them with tragic consequences. DEA agent Héctor Berrelles, who led Operation Leyenda, also witnessed links between the CIA and drug trafficking. When he informed his superiors about the bases where CIA planes transferred drugs, they told him in no uncertain terms: “Keep away from those bases. They are training camps, special operations.” A little further south, Carlos Lehder Rivas, co-founder of the Medellín cartel, confessed that his ‘company’ had been given access to Mena airport in Arkansas by the CIA in exchange for providing the contras with $10 million. The conclusions of Kerry’s report were categorical. “There was substantial evidence of drug smuggling through the war zones on the part of individual Contras, Contra supporters, Contra pilots, mercenaries who worked with the Contras, and Contra supporters throughout the region…. Indeed, senior US policy makers were not immune to the idea that drug money was a perfect solution to the Contra’s funding problems. Mae Grwp Hawliau Dynol America Ladin Clwyd yn trefnu un o’i nosweithiau bendigedig yn Theatr Clwyd eto. Bydd yr Ymgyrch gyda stondin ar noson Hermanos Millar ar Dachwedd 15. Hwn yw eu unig gig tu allan i Lundain ar eu taith Ewropeaidd. Mae’r grwp o Chile wedi cael eu dylanwadu gan fudiad Canueon Newydd Chile, a gynhwysodd cewri fel Victor Jara a Violeta Parra. 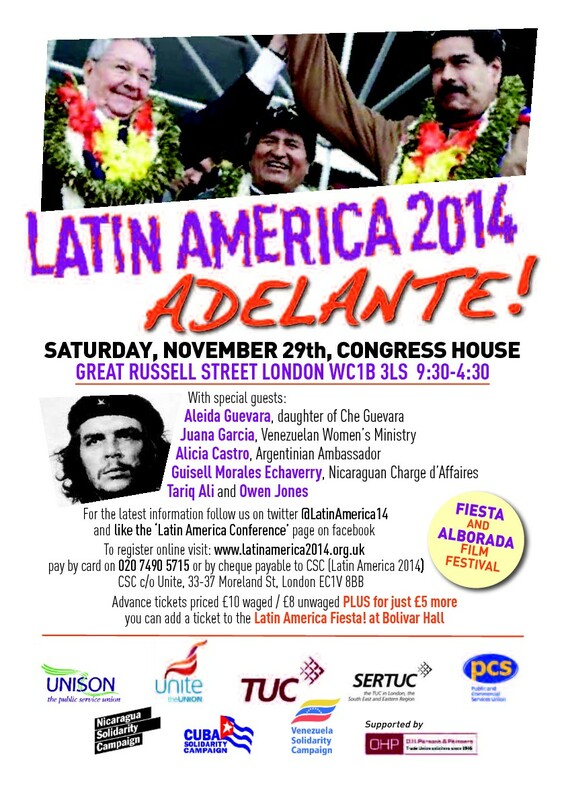 The Clwyd Latin America Human Rights Group is organising one of its excellent gigs again in Theatr Clwyd. 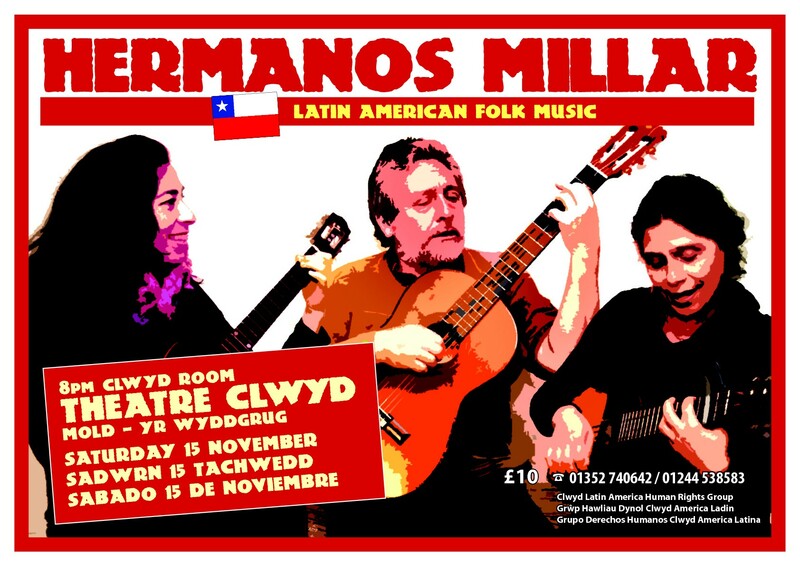 The Campaign will have a stall in the Hermanos Millar gig on November 15. This is their only gig outside of London on their European tour. The Chilean group has been influenced by the Chile New Song movement, that included giants like Victor Jara and Violeta Parra. More analysis is appearing on a regular basis about the impact of the canal. A lot of the heated debate focuses on its environmental impact. For those in favour, the project is seen as a way of protecting the environment, particularly providing economic opportunities which will halt the movement of the agricultural frontier, and undertaking a huge re-afforestation project. There’s no doubt that the area along the route has been the subject of degradation for many decades. 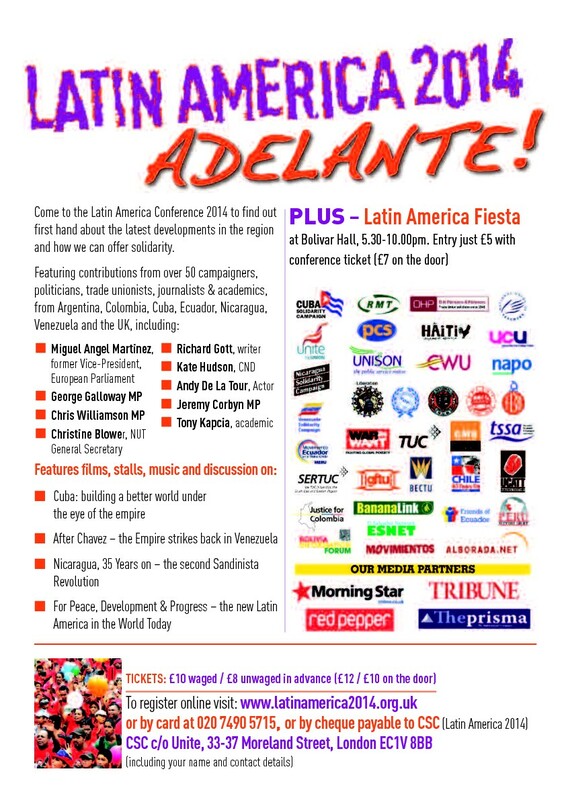 Earlier this week Toni Solo on Tortilla Con Sal lambasted the international coverage of the canal, particularly from newspapers like the Guardian (The Sensationalist Campaign against Nicaragua’s Interoceanic Canal – see here). Instead of seeing the canal as devastating a pristine environment, Solo presents the case that the canal might be the only way to save the rainforest. 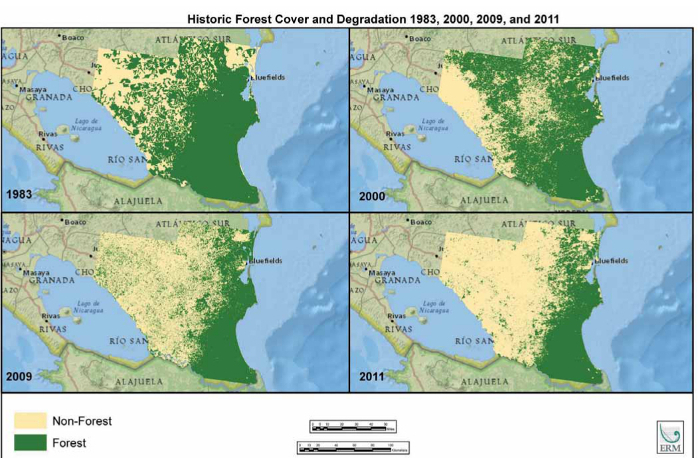 At the heart of the article is a startling map, which shows the progress of the agricultural frontier since 1980. Even during the Revolution of the 1980s, the vanishing of the forest continued. The policies championed by people within the government like Jaime Incer only managing to slow the rate of disappearance. There’s no doubt what this means for the people living on the land. In March the Nicaragua Network visiting the Bosawas reserve. It’s in the north of the country, well away from the canal route. But the desciption of the pressures that face indigenous people in the Bosawas is exactly the same as those faced by people on the South Caribbean Coast. Every indigenous group we met with has experienced a massive invasion from all sides, starting slowly decades ago and increasing with time. There are now almost as many mestizo campesinos on indigenous land as there are indigenous. The Mestizos are even talking about marking out their own territory in the indigenous area. More come every day, clearing the forest as they go, using the land for pasture, crops and more cattle than the land can support. Some use or sell the wood, others simply burn it. Not only is the land deforested, but the cattle further damage the land and pollute the rivers. On Sept. 29, the Cocibolca Group, composed of environmental and other civil society organizations, held a forum in Managua where they presented the results of their independent study of the social, environmental, and legal impacts of the canal. The study reported that 109,000 people will be displaced by the canal which will also affect 193,000 hectares of forest, more than 40 species of animals, as well as nature preserves that include protected wetlands. Maura Madriz of the Humboldt Center said, “Almost 60% of the area affected by the canal is covered in forests, including broad-leafed forests, mangroves, and palm. It is not true that all of the territory which the canal will go through is destroyed and, even if it were, that is not justification for a project of this type.” The study examined the territory ten kilometers on each side of the chosen 278 kilometer route of the canal. The Humboldt study indicated that during the rainy season the canal will need 7.5 million cubic meters of water each day and during the dry season 8.4 million cubic meters while the current supply is 14.7 million cubic meters. However, Victor Campos, deputy director of the Humboldt Center, said, “Due to climate change, between 2015 and 2039, we expect a reduction during critical years of up to 35%, which would leave available only 8.45 million cubic meters of water daily, meaning that the canal would be operating with all the water available and by 2039 with a deficit of three to four percent.” Campos said that, in order to fill the planned Atlanta artificial lake, 7.4 billion cubic meters of water would be needed from the watershed of the Punta Gorda River. This would take three consecutive rainy seasons making it unlikely that the canal could begin operations in 2019 as proposed, Campos said. Little assurance that even if the environmental impact study is done rigorously and seriously it will be taken into account. The absence of the environmental aspect in the law, which could remain at the discretion of the concessionaire. The loss of a legal framework for the government of the Republic to act as the representative of the people of Nicaragua and defender of the nation’s natural heritage. A marine impact with potential pollution problems to other countries in the region as well as the coastal marine impact in Nicaragua. A drastic impact on Lake Cocibolca, a valuable freshwater resource, knowing that the importance of this resource will grow enormously with the passage of time. Change in the course of the rivers affected by the canal that would increase the amount of sedimentation, both in the rivers and the lake. The canal’s exit point on the Pacific coast conflicts with plans for developing tourism. 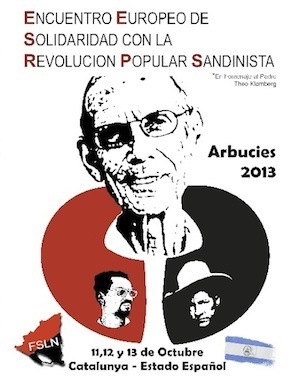 Also, the Campaign has received an invitation from the Charge d’Affairs to attend the 2nd European Solidarity Conference with the Nicaragua Revolution, being held in Rome from November 21-23. The first meeting was held in Arbucies, Catalunya. Here’s last year’s poster – more details about the meeting in Rome to come. Hefyd, mae’r Ymgyrch wedi derbyn gwahoddiad gan y Charge d’Affairs i fynychu’r 2il Cyfarfod Ewropeaidd Cefnogaeth i’r Chwyldro Sandistaidd, cynhelir yn Rhufain rhwng Tachwedd 21-23. ‘Roedd y 1af llynedd yn Arbucies, Catalunya. Dyma boster llynedd – mwy o fanylion am y cyfarfod yn Rhufain i ddilyn.